Over the past few months, I’ve been working on a wedding invitation project for two of my great friends from university, Jules & Nick. After nine years together, they are (finally!) getting married in Dorset next month. 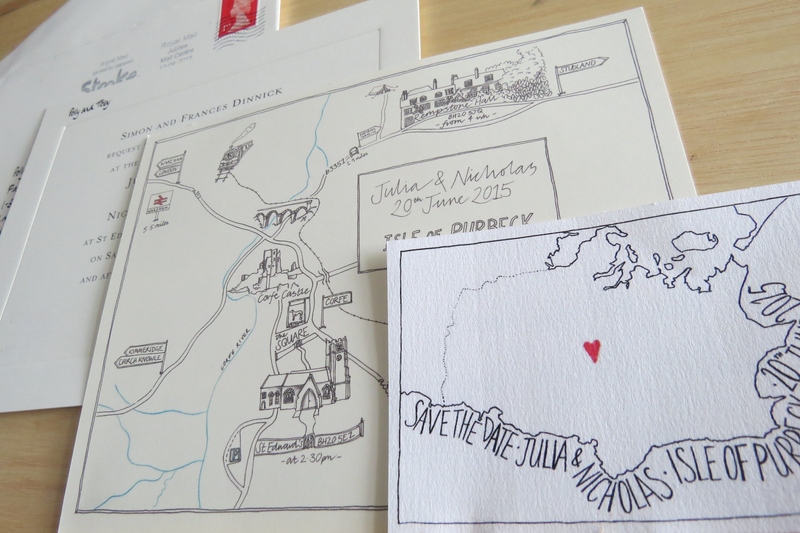 The first piece of the puzzle was creating a Save the Date card to whizz out at the start of the year. 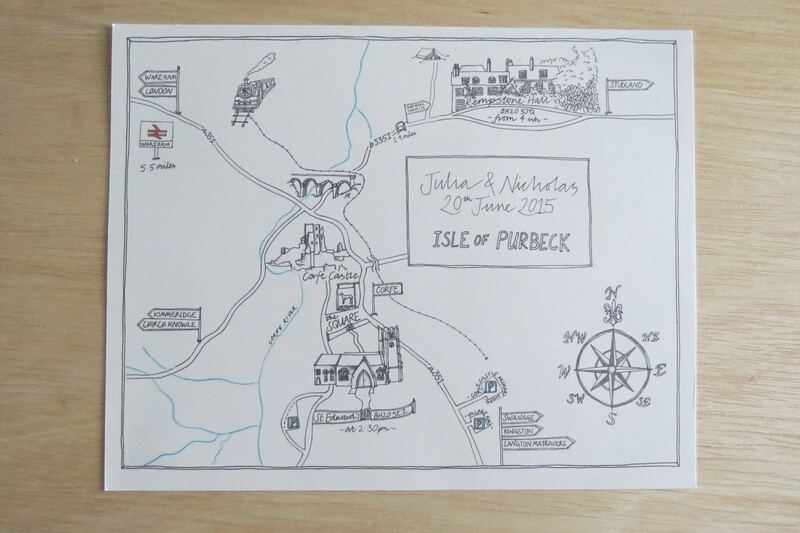 We kept this nice and simple, and took Jules’ idea of an focusing on the wedding location – the Isle of Purbeck – to decide on a pen and ink map outline of the area, with the wording following the coast as it winds around. 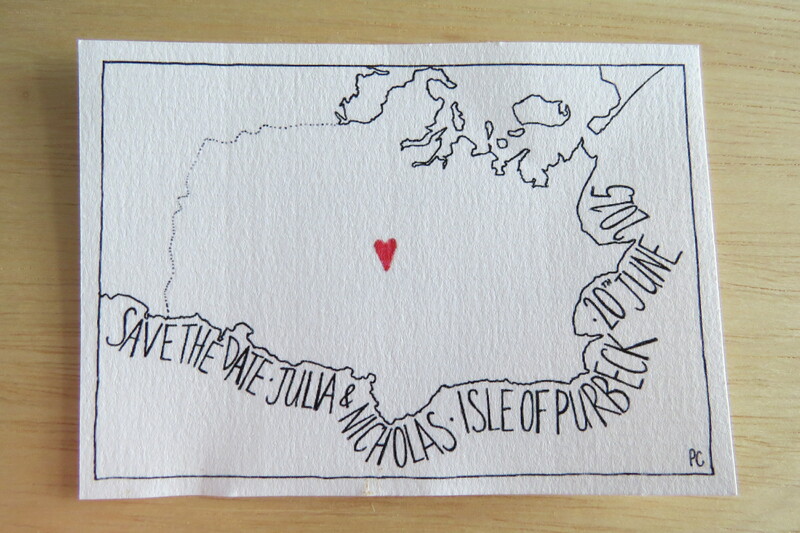 Conveniently they are tying the knot in Corfe which is bang smack in the middle of the map – so a little red heart marks the spot. A few months down the line, the map idea continued when Jules & Nick asked me to design a map to guide their guests around on the day… this needed to be practical – and usable in real life! 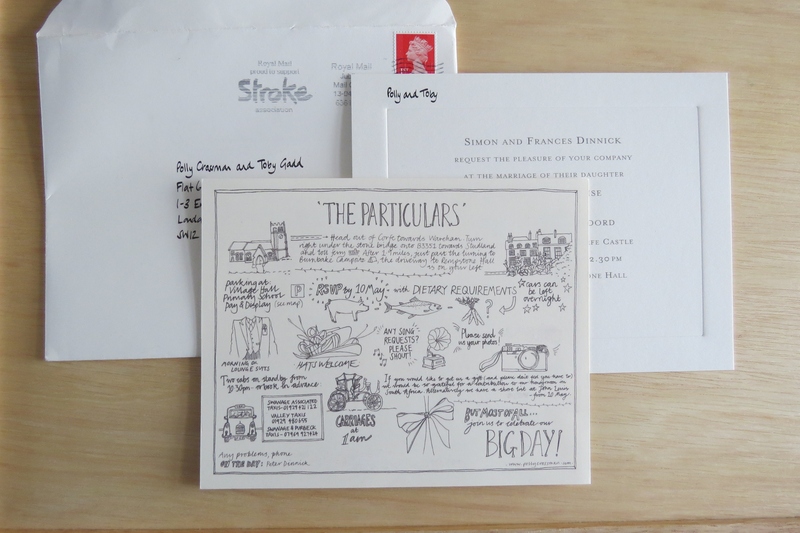 – as well as something special to go alongside their invitations. 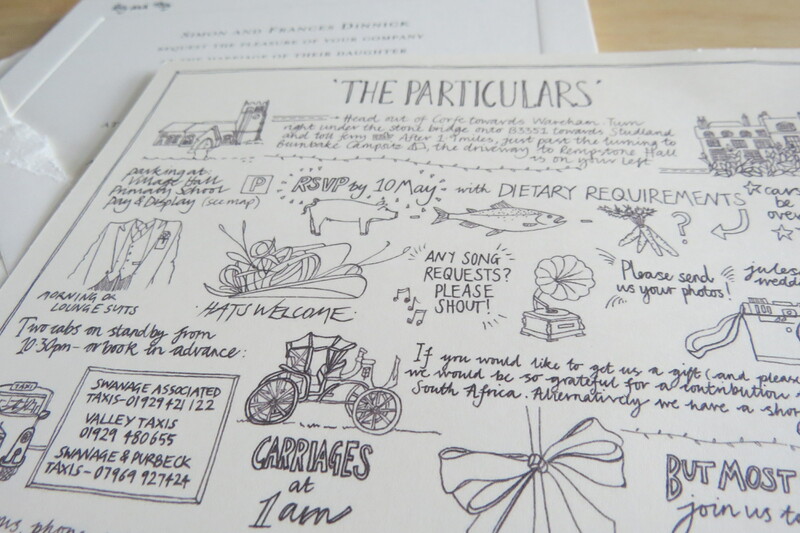 I took the landmarks of the day – the church, the reception venue, the nearest pub, Corfe Castle – and turned those into little drawings that were then linked together by roads, rivers, signposts, stations and bridges to create a map. I wanted to combine the quality and detail of an Ordnance Survey map with the feel of a vintage sea-faring map, so the river and parking spots turned blue, and the compass and title plate made the finishing touches.  The final element to the project – and my favourite bit! – emerged from an evening spent doodling at home. 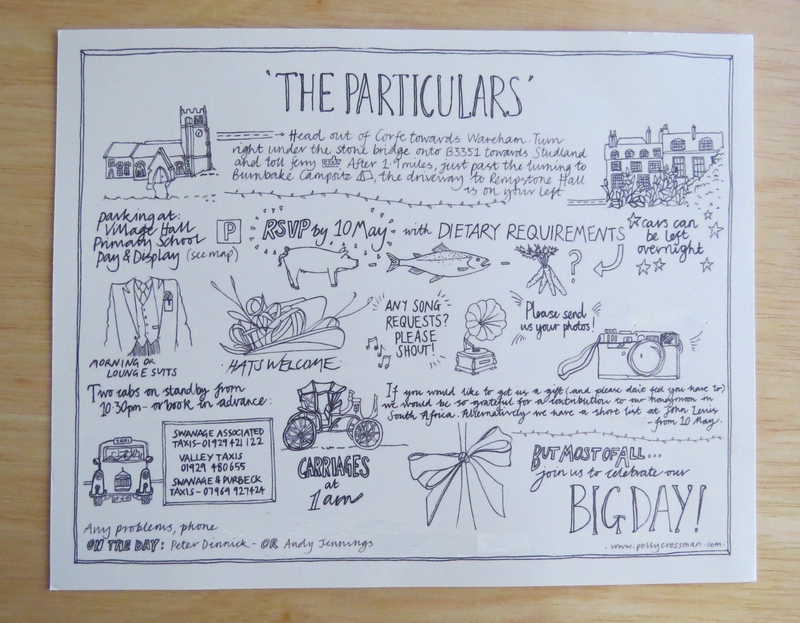 In the same vein as taking ordinary details from a map and turning them into drawings, I created a ‘Particulars’ card that made all of the important details of the day much more fun and intriguing. A request for dietary requirements became a pig, a fish, and a bunch of carrots. The dress code became a drawing of a morning suit and a big hat. Song requests became a gramophone, home time became a carriage, and the taxi numbers became… well, a taxi… until every element of the day had it’s place and everything fitted together in drawing and text. I’d love to hear what you think. Roll on 20 June!